← What is space junk? Astronomers studying an exoplanet over 400 light years away have found that it has a system of rings similar to those around Saturn. The planet was discovered when two separate survey projects noticed the light from a star in the Scorpius-Centaurus association (the nearest region of recent massive star formation to the Sun) dimming slightly at regular intervals. After eliminating other possible explanations, they concluded that the star must have a planet, and that it’s orbit was aligned with the Earth, causing it to block out some of the star’s light once per orbit. When Eric Mamajek (Assistant Professor of Physics and Astronomy at Rochester University) and graduate student Mark Pecaut studied the recorded light curve more carefully, they found that it did not dip in the usual smooth manner. Instead, it dimmed irregularly — whatever was eclipsing the star could not be spherical in shape. 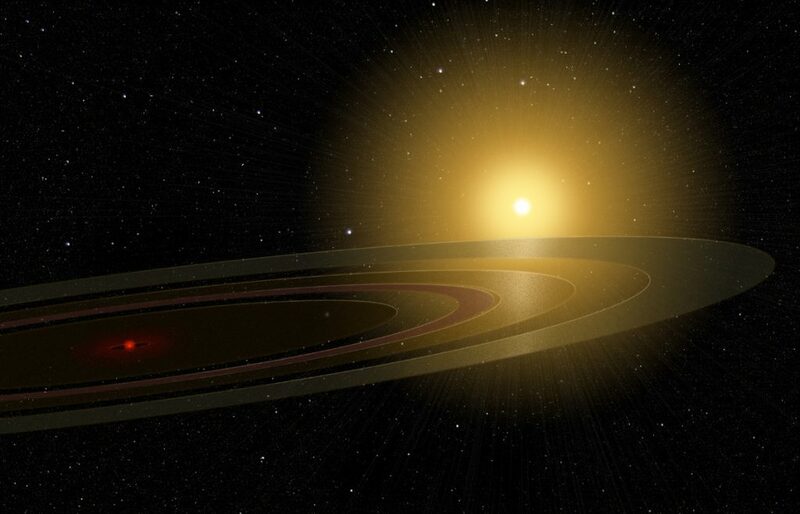 Of course, we should not be surprised to find ring systems outside the Solar System. Although Saturn’s rings are unique for their incredible brightness and beauty, rings can be found around most planets in our own Solar System, provided you look with sensitive enough instruments. Perhaps they will turn out to be almost as common as planets throughout the universe.